Here’s the thing about movie metaphors: They’re not scary. They’re not dramatic. They’re not the movie. The movie is the movie. The metaphor is what, after you’ve enjoyed the movie, you can sit up late in coffee shops discussing with your friends. Movies acting as metaphors may, in this way, be exceptional. George Romero’s Dawn of the Dead is a fine example. It’s a fantastic, scary, funny, crazy zombie movie no zombie movie has yet to top. Which is all it needs to be. But hey, also, as a bonus, it’s a scathing indictment of modern society and the zombies—us—who comprise it. Horror is tailor-made for meta-commentary, and good horror movies are rarely without an underlying metaphor powering them. At the very least, you can pull a metaphor out of them, even if the filmmakers didn’t consciously put one in. Writer/director Jordan Peele did this just right in his debut, Get Out. The metaphor isn’t subtle, but neither does one have to ponder it while the story’s unfolding to engage with the story. It’s a freaky story all on its own. The metaphorical angle only makes the already powerful story that much deeper. With Us, Peele goes all-in on his metaphor, but forgets to put a movie on top of it. Boredom and silliness ensue. Story-wise, there’s little there there. 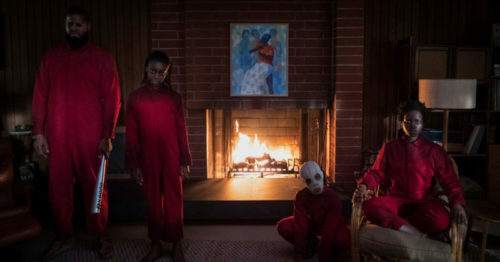 A family of four, Adelaide (Lupita Nyong’o), Gabe (Winston Duke), and their two kids goes to their summer house in Santa Cruz, only to have their doppelgängers, dressed in matching red jumpsuits, turn up and try to kill them. At length—at grievous, patience-taxing length—out heroes try not to be killed. This makes up the bulk of the movie. The major problem here is that the doubles aren’t grounded in any kind of reality, be it real-world-reality or movie-reality. They exist only in the land of Important Social Metaphors (ISMs). Maybe you find ISMs scary? I don’t. I find I can’t stop asking myself why I’m supposed to care. Now, if these ISMs in red jumpsuits merely appeared, without explanation, to terrorize and mystify the family, we might have had a movie. The unknown is always scary. One might say it’s what underlies our fears, every one of them. But Peele makes an unfortunate decision here. He explains his doubles—but only does so half-assedly. The Adelaide double does the heavy-lifting, in a long, long, very long expositional speech about where they came from and why they came. Then, at the end of the movie, she delivers another one. Lupita delivers her monologues with expert creepiness—she’s the best part of the movie—so it’s a shame everything she says is a bunch of malarkey. It’s like this (and yes, everything following is spoilery): Some longish time ago, the U.S. government created doubles of every single American and hid them in the abandoned tunnels which, you see, criss-cross the entire country. Not only that, but they did it in such a way that the doubles were “tethered” to those they imitated. Why do such a thing? So the government could control everyone, of course. But alas! The plan did not work. So the people were simply left to their own devices in the tunnels, to survive any way they could, all the while running, jumping, etc. in exact mimicry of those topside. Oh, and also? There are rabbits in the tunnels. Lots and lots of rabbits. Which is what the doubles eat. Got it? A brief survey of interweb chatter tells me that to complain about the logic—or total abandonment of it—is to not get that it’s an ISM. We’re not, apparently, supposed to start asking questions about what the movie tells us is its reality. Like, does everyone have a double? Even the government people who made them? How did they make the damn things? That’s pretty high-tech and wizardly of them. How do the doubles get clothes? How to they make all those matching red jumpsuits? Where’d they get those cool leather gloves and scissors? How come they could, all at once, stop being tethered and run around killing everyone? What about when people moved out of state? Did their doubles find tunnels and follow them? Or what about a vacation overseas? What did the doubles do then? Nap? Why rabbits? What do the rabbits eat? Who cleans up all of their poo? Speaking of poo, are there bathrooms in the tunnels? How come all of the doubles don’t have terrible skin diseases from never taking showers and there being poo everywhere? Without doctors, wouldn’t most of the doubles have died by now anyway, especially when mimicing surgeries? For that matter, why didn’t an influenza epidemic just up and wipe them all out? And etc. There are many cases of minor logical details in movies that, indeed, one shouldn’t bother with. That don’t matter to the story. That are simply what happen in movies. Everything can’t be explained. There’s no time. No purpose. We let those things slide. But in Us, Peele brings it on himself. He didn’t have to explain his doubles. He didn’t need a bizarrely improbable conspiracy theory to back up their appearance. They could have just existed as mysteries. As the unknown. They could have simply appeared. No tunnels or government plots needed. That’s scary. To halfway explain a bunch of nonsense is to turn it into the literal, into what is actually happening, and of the literal one is at liberty to ask questions. So. As literal doubles, the doubles make no sense whatsoever. Yet, at the same time their literalness is being explained, it’s clear they’re not supposed to be taken literally, they’re supposed to be ISMs, about whom we might have thoughts deeper than in those found in less thoughtful movies. We might think of the doubles that they represent the dispossessed, the oppressed, those in our society we’ve tacitly agreed to ignore, and that our hero family represents the children of privilege, the oppressors, they who’ve made miserable the lives of those who exist, shall we say, underground. Let me tell you a story. Get comfortable. This may take awhile. Presenting deeper metaphorical thoughts to be thunk is great. But we’re back to where I started: Wishing for a coherent story to enthrall us while the ISM is chugging along underneath it. Wishing, too, to be scared. When the doubles arrive, they’re certainly creepy. What are they? Why are they here? What’s going on? They’re not scary, because I don’t know what they want yet. They’re just a bit eerie. Then—then they sit everybody down for a chat. Now, to me, that’s not the least bit scary. I know what zombies want, what vampires want, what most movie monsters want. These doubles, though? Who knows? Looks like they’re going to sit us down for a lecture first. Maybe they just want to swap places with the real family, or assign them a spooky task, or offer to team up with them. Who knows? Well, we hear the speech, and it’s still up on the air. I guess, maybe, they’re going to kill the real family? Yes, it looks that way. Slowly, though. It’s a game, it seems. They provide enough time for the family to escape. Nope, not scary. A bit dull, really. Instead, there’s only the ISM to keep us interested. Which then grows confusing, because if we’re there with the ISM and not directly with the story, then the hero family we’re supposed to be rooting for isn’t actually heroic. In terms of the ISM, they’re the problem. The enemy. We should be rooting for their deaths. But wait, you say, having seen the movie. Peele’s no dummy when it comes to his ISM; it’s what he appears to be most interested in. He gets that his family are the baddies—that is, all except for Adelaide. You might not believe it, but the Adelaide we think is the real one, isn’t. She’s the double. The movie opens in 1986 when little girl Adelaide stumbles into a funhouse and meets her evil double. During which opening scene, you will assume, if you’ve ever seen a movie before, that the two girls are switched. Because we only see them meet—then cut to Adelaide all freaked out and silent and suspiciously weird from her briefly being lost in a funhouse. This thread gets lost in the shuffle of people stabbing and beating each other to death, and I decided I was being overly clever to think such a thing. But no. The very end of the movie offers this up as a twist. A twist to let us know that, in a way, we’ve been rooting for the right Adelaide all along. Not the one we thought we were—she represents the thoughtless oppressor the underclass is destined to overthrow—but the double, and a sneaky double at that. One who escaped her captivity and took on the trappings of those above, which whom she intends to remain. Which, hm, doesn’t that make her just as evil as real world Adelaide after all? I think it does. Rats. So, wait, who am I supposed to care about in this movie? I’ve become mired in metaphor and can’t seem to get out. Neither can Peele. I’m glad he’s thinking big thoughts, and wish more high-profile filmmakers would follow his lead in that regard, but I’d rather he thought big story-related thoughts first, and tucked in his ISMs beneath them, where they belong. I wasn’t feeling it either. Twas all a bit forced, wasn’t it? Maybe this was one of his Twilight Zone ideas he padded out to two hours? As a 30 minute story, minus the government experiment gone awry angle, it would play just fine.